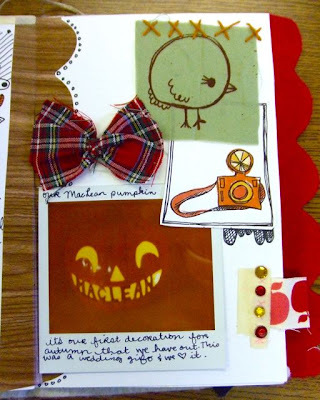 Here are more pictures of my autumn journal so far. I am loving just being able to write on random pages :) I love love love this journal. I want to do a little experiment and I need your help. =) If you're reading this right now, could you please just leave a comment and say "hi" or whatever. Introduce yourself if you've never commented. I'd love to meet you. Tell me what your favorite thing about Autumn is! It is the first day of my favorite season!!! Or tell me something that made you happy today! Or your favorite quote! Or maybe just your favorite color. Or a random fact about yourself! Anything. Hi, vivianna here from Polka dot robot. I love fall and I love you! hi, it's Lehua from Heart on My Sleeve & I really think you need to update your phone to have internet so you can twitter at work. my name is katie and i am usually a lurker. it has nothing to do with you. it's me. i have this problem called laziness [i don't want to click through from google reader] and paisley [who only lets me be on the computer so long]. but i'm excited about fall [because i've never experienced fall before]. my favorite quote from today is "i've got so much time and so little to do. wait... strike that. reverse it." and my favorite colors are robin's egg blue and lemon yellow. What I loves about Autumn, apple cider and cool nights. fall is my favorite season for many reasons (of which i may blog about, haha) but one is because i'm always ready to get back to school. granted this not a possibility for much longer (i'm a sophomore in college), but still! oooh. me love your book! And I understand about lack of comments! Comments make me happy! Hello, my name is Erika and I have a wonderful 2 year old daughter that makes me notice things that I did not before. Like mommy trees are dancing! Also, love autumn because I like colder days with a nice cup of hot chocolate and doing some crochet or sewing some homemade toys for my family :) Have a nice day! my name is heidi; i read your blog! and i love autumn and your style! i can't find the autumn craft kit anywhere on rva which made me really sad it's so cute! if you did not get the planner, i recommend it, it's the best purchase i've made so cute and fun to stay organized now!! i totally hear you on the comments thing--i always have tons of new hits, but very few comments. i love fall because of halloween, and pretty leaves, and perfect weather. I just recently discovered your blog. I started following because you bring lots and lots of inspiration. My story is I'm a librarian but was fired from the budget cuts in California. Now, I'm a stay at home wife, and in a rut. I'm looking to find some motivation and inspiration besides the freelance writing and photography i do. i love hot chocolate. it becomes an addiction once fall hits. love your blog....im working on commenting more! Good day, Love!!! 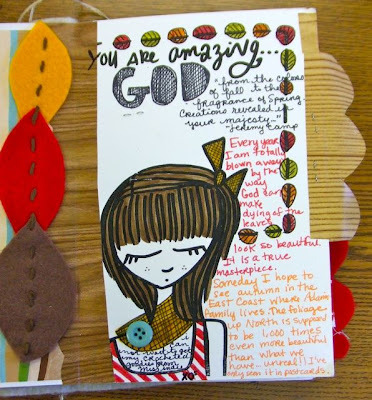 I am so in love with your Fall journal!!! That pumpkin you carved is just awesome!! What a great idea!! I love your blog and I love you!!!! I'm still thinking about when I watched a Monarch butterfly come out of it's chrysalis with my preschool class yesterday. It was a beautiful, incredible sight. Some photos here. Have a great week! confession: sometimes I wish my son had a mute button. Autumn is BY FAR my favorite season because my favorite holiday is Thanksgiving! I also love scarves, jackets, leaves changing color, fireplaces, bonfires...the list goes on and on! Hope you have a great day and get the 1,000,000 bloglove comments you deserve! Hey Janel...my favorite thing about fall are: the smells (pumpkins, cinnamon, pies, cool air), decorating my home, and carving pumpkins. I really could go on and on. I had a couple great things happen to me... I got a free pumpki spice latte from Starbuck compliments of my mom, saw my brother off to Spain at the airport this morning, and have had the most comments on my blog today!! I had seven! Hey it is the small things...and thanks Janel for your comment. I'm Toni from little suitcase. I am a terrible dancer. Think of Elaine from Seinfeld and I'm worse. I think you are a beautiful caring person and I love your positive and inspiring blog. Makes me very happy to visit here. Hi Janel! I also found you through the RVA Autumn class :) great blog. I'm from Australia so it's just going into spring here, my favourite time of year!! Hello :) I am Jessy, an Australian! I found your blog thanks to Becky from Strumpets Crumpets and her contribution to your quilt! One of my favorite things about fall is Candy Apples! i there! i agree with the comments thing! sometimes i only get 1 or 2, but i know tonnessssss of people look at it. here's to autumn and corn on the cob and walks in the wind with big coats! I will be posting some of my classroom ideas to my school blog soon. I was waiting for someone to push me in that directions. :) Thanks. I love autumn because it is almost Eggs-a-ronius hat time. 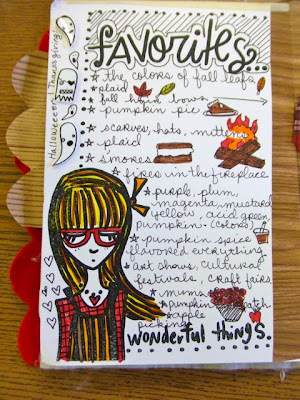 i love the fall journal... was that a kit from elsie (like can you buy it at redvelvet), or did it come in her craft kit for the fall? i'm loving the rainy/cold/fallish weather!! Hey girl..you know who I am and YES I am bad about leaving comments. :) we all are aren't LOL.. ONE of my fav. things about fall is the colors....but you know me. I could go on an on. I totally love your blog. You are so innovative and have such a talent. Keep up the great work and as always I look forward to your next post. LOVE how this autumn journal looks!!! Hi! I'm Jackie and I just recently stumbled upon your blog. I adore fall and can't wait for the cool, crisp weather. I got to sleep in today, which made me very happy! the bird in the first picture, i have that as a brooch. 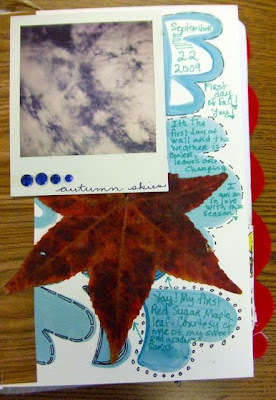 your autumn journal is looking so beautiful. i forgot to tell you what i love about fall. my grandmother makes this drink called wasel. it's sooo good! it's like a cider, but there's orange peel in it. and you leave the peel and cinnamon sticks in it. wow! you got 38 comments yesterday! GREAT JOB! Hi! I'm Sarah. I read your blog thru my Google Reader. I moved to Los Angeles from Michigan three years ago and I'm really being to miss the change in seasons! It's still in the 90's and sunny here. What I wouldn't give for some cool crisp sweatshirt weather! I love your album! I agree with the comment thing, although I'm a newbie at blogging. Glad to have a new blogging friend with so much inspiration. I'm Jaymi. And I'm a lurker. ("hi Jaymi") I'll comment if I absolutely have something to say, but I'm mostly shy. I'm super excited about this autumn because my 3-year old understands sooo much now. I can't wait to share EVERYTHING with her: the pretty fall leaves, pumpkin carving, hot chocolate, halloween, etc. I remember you commented on my blog once and I was super excited thinking "Hey, it's Janel. I follow her blog and now she has commented on mine! Wow." Hi Janel, I'm Ashleigh. I found your wonderful blog through the RVA autumn craft class :) I've commented before but never really introduced myself. Fall is my favorite season (this year, anyway). I love your blog! :D We dont have autumn in Costa Rica. Just summer and winter. but I love halloween :) yay! Hi. :) I'm just a blogger wanderer. I only recently found you. We wouldn't worry so much about what others think of us if we knew how seldom they do. Embrace your inner geek. Life's too short to be cool. i can't wait for new moon.